Settled at the top floor of the newest boutique hotel, Domicillo, you literally dine with the clouds and the stunning scenery. A bit tucked in, you need to go upstairs to find Aozora and the shared view deck with Domicillo. The restaurant's interior has to be an extension of the hotel's restrained style which is minimal, subdued industrial yet classy. Aozora's zen-like ambiance perfectly blended well with Domicillo's. The cafe was still at it's soft-opening and is still adjusting with both the resto's and clients' needs, thus this menu, though I think by now they have the formal menu. Though it never did bother me, seeing the Japanese chef's penmanship on the wooden clipboard. Refreshing drinks that sure have blended well the ambiance of the venue have welcomed us. The odd-looking neon green drink is Aozora's signature drink, Aozora Iced Tea. It's a blend of lemongrass, mint and a secret Japanese concoction. We were also given a complimentary trial taste of Kalamancello. An alcohol drink made by a relative of the cafe's owners. It's like Limoncello but had made use of our local lemon, the kalamansi. Both these drinks really perked me up and gave that extra zing to prepare me for what's said to be a good lunch. Dining in Tagaytay for our family meant having Bulalo, so it was a treat for me having Aozora Ramen (Php 295). Both worlds of Japan and Batangas have been combined in this piping hot bowl of goodness. Inspired by Tagaytay’s infamous Bulalo, or beef marrow soup as internationally known, Japan's typical ramen was given a Pinoy twist by incorporating the broth of the bulalo along with its vegetables into a ramen dish. the noodles as well as most of their ingredients were flown in from Japan, making your dining experience here authentic. 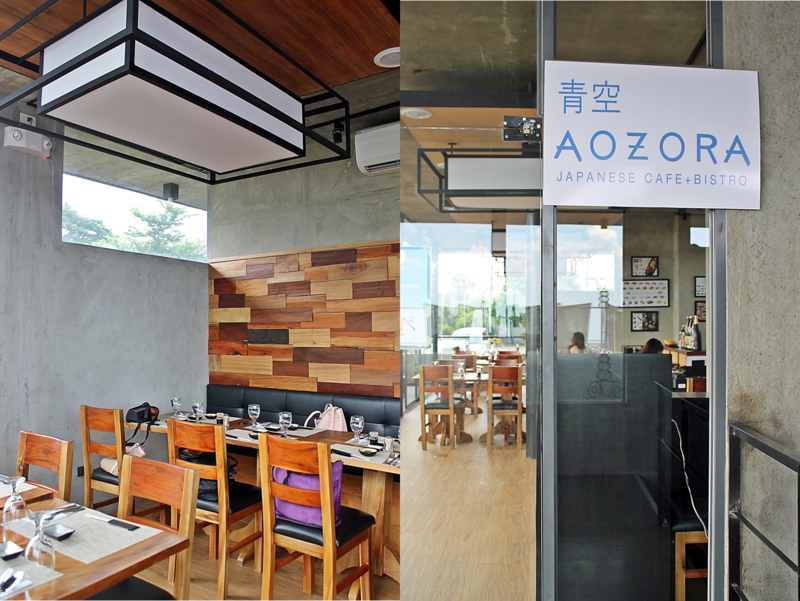 It is also one of Aozora's main concern to support local market, aside from using fresh ingredients to all their dishes. Thus the beef is bought and most of the vegetables at Mahogany Market, said to be the central market of the area. Pardon me, but I have this thing with plates and I just need to mention my commanding appreciation to unique plates and this one met my category. Aside from the platter, the line of salmon, tuna, tamago, and shime saba (Japanese pickled mackerel) maki made this a real work of art, both in general the essence of general art and culinary. The dish I'll be coming back for is the Pork Belly Yakiniku (PhP 390). Yakiniku is a Japanese version of barbecue. Beef is mostly used with this dish, however, Aozora opted to us pork but, boy, was it a great idea. I love how soft and tender the meat is and the chef just nailed the sauce that goes with it. The yakiniku is best eaten with Yakisoba. Stir-fried friend noodles and vegetables made enticing with the soy seasonings. This simple dish was made fancier with spatters of bonito flakes shreds. For the sweet-ender, you may want to try their dessert tempura. We had Mango Tempura Ice Cream (PhP 180) which can be shared by two. I wish I could have also tried other tempura dishes but then...maybe on my next visit. I do like the presentation with a topping of vanilla ice cream, but as Alton Brown puts it, tempuras are meant to be eaten with a dipping. I wish they could have opted for a separate dipping sauce (probably the one chosen by the diner, say a salted caramel, chocolate ganache or fruity dips, etc. ) rather than having the ice cream sog the tempura casing. The pop of mango inside was really interesting. Another great way to enjoy a Japanese meal with the clouds and of course your favorite bunch (or your date) is with their Sumiyaki coffee. They are using the brand Key Coffee which is apparently the no.1 brand in Japan. I like how robust and strong this coffee was, quite a change from my regular Italian brew. If you are going to visit Tagaytay or simply wanna try the only Japanese resto in the area, the drive from Manila is going to be well-worth it. The price is very competitive and really affordable considering it's authentic Japanese cuisine, prepared by a real Japanese chef on a very classy hotel with such stunning view of Taal...what more could you ask for? Thanks to Aldous of Aldous Ate the World and Ms. Christine Villongco for inviting me here.